HR TRANSFORMATION – IT’S NOT REALLY ABOUT HR. 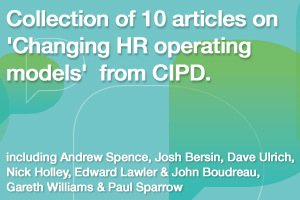 Although HR is the focus, the outcome is about improving People Management in organisations. HR is well positioned at the crux of workforce, productivity and human beings. This is really about “Workforce Transformation” with HR making the rallying call. Get some facts and make the case for change. Create a Vision. Make a Plan. Execute. We don't want to make it sound easy, it's not. However we have developed a methodology and training material that clients have found helpful over the years. 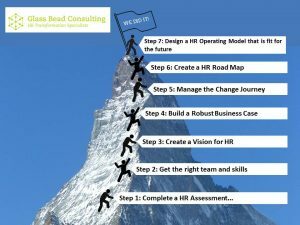 7 Steps to Transform HR, was developed to provide useful tools and frameworks for teams to use during a transformation programme. What is the current state of your HR function and how does it compare to your competitors? How do I produce a business case that sells the project to my senior stakeholders? What processes can I outsource, what are the potential benefits and pitfalls? What is the best way to construct a HR Transformation project team? Is my organisation ready for a HR Transformation programme? How can I ensure I avoid the pitfalls and problems that others have experienced?